I cut the top of the milk carton off at the score line so the roof would fit flush. Cut 3 pieces for the roof. 1 3/4" wide by 4",3" & 2" long folded in the middle. Scollop the ends with the scallop edge punch. I laid the roof on a wax sheet and used crystal effects sprinkled with dazzling diamonds along the egdes. The gable looked a too plain so I added a heart and a little strip of Whisper White punched with the pinked heart edge punch. To make the cardinal punch and extra wing to use for the point on the top of his head and color the face black. Scroll down for a close up. The greenery was made from the snowfalke punch. I made these birdhouses for swaps at our Demo Christmas dinner last night and a few extra for neighbours who don't celebrate Christmas. I discovered that if you make the roof in two pieces and stick it together like I did in the photo, it will hold your milk carton shut. For the roof I cut 2 peices of cardstock 2 3/4" x 1 3/4". Score the two short sides at 1/2" and punch the corners with the pinking hearts punch. Before assembling the birdhouse, use the 3/4" punch to make the hole for the bird. Here's another punch art Christmas card. I had fun making this one. I used all current SU punches. I used the Christmas Punch stamp set for the sign. Real Red and Chocolate Chip Cardstock and the DSP hostess pack. I used silver cord and the tree ornaments die for the bulbs and coated them with crystal effects. Scroll down for the punch art instructions. Well Stampin' Up has come out with another great mini catalouge with loads of new products. The Mini Milk Carton die was the first item on my wish list that I couldn't wait to try. I'm making some of these Gingerbread houses for friends and neighbours. This was my trial run. The next ones have a hole in the roof for a gold cord so it can be hung on the Christmas tree. I cut the top of the box off at the score line so I could attach the roof. The Roof is a piece of whisper white 4" x 2 3/4" folded in half and scored the width of the box. I used the eyelet punch for the roof edge but I think the new pinking hearts punch would be perfect for this (it's next on my wish list) The medallion is from the Delightful Decorations stamp set. The "Merry" looks a little blurry in the photo because there's a ridge of glue and dazzling diamonds dripping over the top edge. The shrubbery is made from the Snowflake punch. The candy corners are 1/2" scraps of whisper white. I drew half circles with Real Red and Glorious Green markers, sponged the edges with red then embossed them with clear. The chimney was cut from a scrap of Creamy Caramel that I trimmed until it fit. I stamped the dogs from Loads of Love in the window. Use Stampin' Up's Movers and Shapers die to make a quick and easy pizza box. You can download the free tutorial here. I found the chocolates at COSTCO and wrapped them in scraps of Designer Series Paper. 8 of them fit nicely inside the box. Do you like to scrapbook but just can’t seem to find the time? Here’s a quick and inexpensive way to finish an entire 12” x 12” album complete with photos in one sitting. You can purchase the instructions to complete 20 double sided layouts using only one of Stampin’ Up’s Simply Scrappin’ Kits. You'll also end up with one extra sheet of 12 x 12 cardstock to use for mats or for another project. The instructions include photos and written directions of each step plus photos of each individual page so you can quickly and easily put them in order. I've also included some basic scrapbooking tips so you can have your photographs ready to go when you start your album. If you’re a demonstrator who’s interested in offering scrapbooking classes, this is an easy option for you. I’ve used these instructions for several scrapbooking classes where each participant used a different Simply Scrappin Kit and in 2-1/2 hours went home with a complete 12 x 12 album (20 layouts) including photos. Some of the participants had never scrapbooked before. You can purchase the instructions for each Simply Scrapin' Kit for $5 USD. They will be sent out via email in most cases within 24 hrs of receiving your order. If you live in Canada you can order the Simply Scrappin' Kit of your choice from my Stampin' Up Website and have it shipped right to your door and I will send you the instructions for free. Linen photo albums are also available under "storage". You can complete an entire album in one afternoon without leaving your home. I can't remember what this started out to be but I cut a pennant and started folding until it looked like something. So here we are. You can download the free tutorial here. To add wings cut a large butterfly using Stampin' Ups Beautiful Butterflies die. This punch art Santa was inspired by Sherry Hostetter. 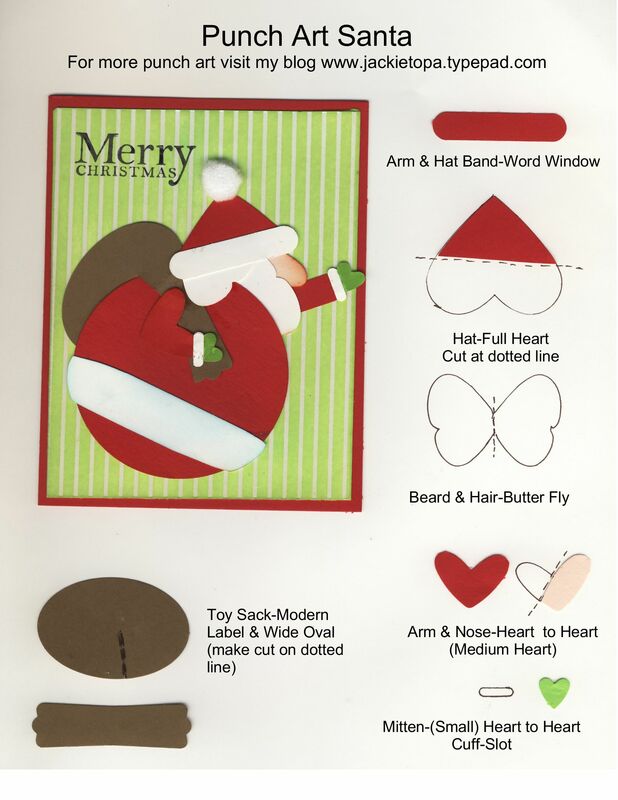 She sent my a cartoon clip art Santa and asked if I could make one from punches and share it with Late Nite Stampers. So here it is. SU doesn't carry a punch large enough for the body so you'll have to cut a 2-1/2" circle using your circle cutter. The rest is made with Stampin' Up punches. Three cheers for My Digital Studio!!! I've been trying to come up with an easier way to post instructions for punch art (not an easy task when your computer skills are as sad as mine. Ironic that my first MDS project is punch art. You can find this file with my Penguin card a few posts below this one.